Completely made from scratch with every order, this Organic Safari Diaper Cake will be the talk of the party. 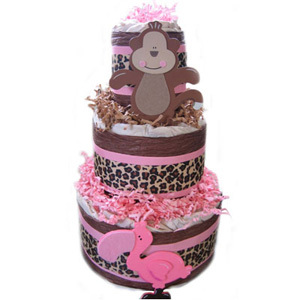 A stunning baby shower centerpiece decorated with high end pink and animal print ribbon is perfect for a Jungle themed baby shower or a baby gift to any mom expecting a baby girl. We choose to use Weleda Baby Cream because it protects the baby's skin using the gentlest and most natural ingredients, such as Calendula, beeswax and almond oil. Can be used as baby's daily facial and body care cream as well as a moisture shield at every diaper change. Calendula works great on chaffed or red, irritated skin.